...that human metabolism can synthesise 8 to 10 (depending on age) of the 20 standard amino acids? ...that the sugar ribose is vital for all life as it is used in the synthesis of DNA, RNA and ATP? 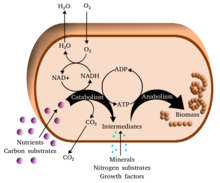 ...that nitrogen can only be fixed metabolically by a group of prokaryotes known as diazotrophs? ...that in humans the balance between anabolism and catabolism of glucose is largely regulated by insulin? ...that hydrogen can be biologically produced by some algae with the enzyme hydrogenase? Navigate by clicking on + to expand the tree section and - to hide the tree section. Click on a link to view the articles in that category. These lists are incomplete, browse the category tree and use the search to find more articles. There is still a lot of work to do on Wikipedia's metabolism articles. Visit the Metabolic Pathways task force page to see what needs doing to the wide range of metabolism-related articles, images and templates. In particular the roadmap for article development may be of interest. On the more general front, the Molecular and Cellular Biology Wikiproject may also have projects of interest. This page is maintained by the Metabolic Pathways task force which is part of the Molecular and Cellular Biology Wikiproject. The Metabolic Pathways task force is related to the Cell Signaling Wikiproject.